A few weeks ago, Manchester band Rivers & Robots released their third album, titled All Things New. As I mentioned in our review of the album, the record is a sweet collection of worship jams firmly fixed on Jesus and the new creation that he enables us to enter into. I recently had the privilege of speaking with lead singer Jonathan Ogden to talk about how the record came together, making music collaboratively, and tea and cake. SAM: Where in the world do I find you today, Jonathan? JONATHAN: You’ll find us in and around Manchester, UK! Can you give me a glimpse of what life is like in Manchester? Manchester is a great city. It’s one of the biggest in the UK, but still feels comfortably small. It’s a big music city too and we get loads of great bands coming through, so there’s always a good gig to attend! There’s also loads going on with the church, some of us work for Christian charities here in Manchester like The Message Trust, so we get to work with churches across the city and see what God is doing. There’s so much going on with prayer, worship and evangelism. It’s really exciting. Even as a band, we’re connected with lots of churches, and involved in things like the Manchester House of Prayer, and Prayer Storm. Rivers & Robots was originally your solo project, what made you expand it to a band? As soon as I finished my first album, The Great Light, I was thinking about doing those songs live and how that would work. I tried to build a whole set using loops and samples with me playing keys and singing, but it didn’t feel right because it sounded like a band even though it was just me. I decided it wasn’t the right time to do it and carried on writing. As I was writing the songs for [second album] Take Everything, I met these three guys (Nathan, David and Kelani) through work, and playing at events like Prayer Storm, who were not only really good musicians, but became great friends too. Then when I finished Take Everything, and started thinking about playing live again, I felt God prompting me to transition into being a band with these three. I prayed about it a lot because it was a huge decision for me, and the more I prayed, the more excited I got about it, so I asked them, and they all said yes! It’s been an amazing adventure of getting to know each other, writing songs and worshipping together. They’ve become my best mates and it makes the whole thing much more fun! Now the new album All Things New is here. How long did it take to come together? We Have Overcome was one of the first songs we wrote and we played that back in March 2013, so we’ve had some of the songs for over a year, and worked on them all during practises in 2013, but then we got them all together and recorded them in February this year at an amazing English country mansion with our friend Aydee. We spent another 3 months after that mixing and mastering it and putting the finishing touches in, with Nathan’s brother Dan. Were there any funny stories from the album recording? Loads! This country house we recorded in wasn’t set up as a studio, we just hired in gear and used some spare rooms, so we ended up recording our vocals in Kelani’s bedroom cupboard, surrounded by duvets and mattresses to dampen the sound, with our engineer Aydee shouting instructions down the hallway in-between takes. We also managed to record the guitar in the wrong key for one song, so when Aydee put the vocals back in over the guitar part he just shouted out “What is that?! It sounds like hell!” We’d also never played Perfect Love when we recorded it. I completely changed the song one week before we went to the studio so nobody had ever played their parts and we essentially wrote each part while we recorded it, we just tried a few things out and then hit record, but it came out surprisingly well considering that! What was the process like making an album as a group for the first time? It was very different for me. For the first two albums, I wrote and recorded at the same time over seven or eight months. Every time I came up with a new idea, I’d record it, and then I just picked my favourites and that was album. This time it was a separate process, so there was a year of writing, but then all the recording was done in a week. This was a very different album in that it was the first time with a band, the first time using all real instruments rather than midi sounds, and the first time I’ve had other people help out with the recording and mixing. Has the process of songwriting changed? Can you run me through how you’d write a typical song (if there is such a thing!)? Yes, it’s changed quite a lot. We still spent a lot of time figuring out how we go about that. I wrote most of the songs in the way I was used to, I’d sit at home and record ideas. But this time rather than those recording being the final album, they were demos that I could stick in Dropbox and then we could work on together as a band. Some songs I brought as just rough ideas, and they came together in practises just by playing them together. This was also my first time co-writing songs. Me and David wrote White As Snow together, he had an idea for a chorus and we just had a jam through it on guitar and keys and came up with the verse chords and melody. Light Will Dawn was a song Nathan wrote and emailed to me, and I realised it fit with some verses I was working on, so I rejigged it a bit and made it a combo of the two. You’re an indie band and you’re releasing this album for free – can you tell me about why you’ve chosen to do that? Ever since we started this one we always said we’d release it for free. We were already blown away by how many people have been listening to Take Everything, and this one we wanted to just give as a gift. It helps that we all have jobs too, so we’re not depending on album sales to earn a living! But then we had the opportunity to partner with Come&Live! to release it, and it felt like the perfect fit for us, because they give all their music away for free too, and they’re a great community of like-minded bands that are going after God and aiming to see this generation loving Jesus. We Have Overcome is a very upbeat track, and a great opener to the record. What’s the story behind it? The idea for this song came to me when I was reading Revelation, and I was really inspired by the way the church is described in that end-time generation as being so passionate, bold and full of God’s power. Particularly in Revelation 12:11 where it says “And they overcame him (Satan) by the blood of the Lamb and by the word of their testimony, and they did not love their lives to the death”. And I just thought how awesome it must be to see a church like that, that doesn’t love their own lives, and is confident in who they are, and who God is. I believe that’s the kind of church we’re going to see before Jesus comes back. So I wrote this song in a kind of future-tense, written from the point of view of that church, who’s confident, ready for Jesus’ return and is able to have the hope that whatever they have to go through, they’re going to be with God forever. Fall Down is such a smooth jam, full of summer vibes! How did that song come together from a musical perspective? I love producing music and having a bit of fun experimenting with sounds. This one started when I found an old bit of archive audio of a radio advert from the 1920s. I put it into Ableton Live and cut it up into individual samples and notes, re-tuned them to fit a melody and then just played around with the sounds over a beat. I come up with instrumental electronic songs like this every now and then, but this one felt like it could be something for Rivers & Robots. So I kept it around and then one day came up with the idea for a melody and lyrics, so the song came together! Listening to You Hear Me… I assume it’s a song about prayer? It got me thinking that there’s not many songs out there about prayer – why do you think that is? Yeah, it is a song about prayer. I was listening to a sermon one morning, and right at the end the guy was preaching about the fact that God actually hears us, and even though it’s such a simple thing it actually hit me for the first time that we actually get to speak, one on one, with the God who created the universe, and that he actually hears us and listens to us. It blew my mind, and so that song came out of that. I’m not sure why there aren’t many songs about it, but that’s part of my aim with what I write too. I want to write songs out of a place of revelation. I want to meditate on God and His word until something hits me and blows my mind, and then out of that, I write a song about it, in a hope that it can hopefully reveal to other people what God revealed to me. And if it’s something that we don’t have many songs about, then that’s even better! I don’t want to just write worship songs with the same old ‘safe’ lines in. Those songs have already been sung. There’s an eternity of God’s character to discover and as long as we keep searching, we’re never going to stop finding new things to sing about. That’s what I want to do! In the Family is such a jazzy gem. It speaks of our new identity in Christ. What can you tell me about the heart behind that song? I love to write songs about God and all about his character and attributes, but I think part of encountering God and finding out who He is, is finding out who we are. So every now and then I write about that kind of thing. I’ve noticed that a lot of people in the church seem to struggle with identity issues, and I have too. But I love to remind myself of what God says about me, and the way he sees me, rather than the way the world sees me, or how I see myself. I think people really need to hear that. We jazzed this one up a fair bit, because we wanted it to be a sort of celebration of what God has done in us! We need a bit of joy in the church! Shepherd of My Soul is another jam. It sounds like you had a lot of fun putting that together as a group, particularly the rhythms towards the end? We absolutely did! I think this was the first one that actually felt like we wrote together. I came with just an acoustic guitar part for that second half, and then in one practise Nathan and Kelani wrote all the crazy rhythm stuff and Dave came up with the electric guitar riffs, and then I came up with the vocal melody. I recorded that practise on my phone and listened to it on repeat in the car on my way home, and I remember thinking “how did we even write that?”. That was a really fun night. Is there a big idea or key message of All Things New as a whole? The key message is always just the knowledge of God, and worshipping Him for who He is and His attributes. The title All Things New I picked right at the end from a line in Shepherd Of My Soul. It summed it all up in a way because it’s a celebration that God is making all things (including us) new, but many of the songs are also looking ahead to the day when He will finally make all things new. You’re all very passionate about the gospel which is so exciting. How important is it to you that you’re sharing the hope of the gospel in your music? I don’t think I ever consciously fit the gospel into a song, because our focus is just to minister to God, and lift Him up through worship. But we are obviously passionate about the gospel and love to share that with people and to tell people about Jesus when we get chance. I guess that just naturally comes out. When you truly encounter God in worship, it’s hard not to tell people! Are there any Christian acts or bands that you see sharing the same message that you’d like to collaborate with? There’s a lot of the Come&Live! bands we enjoy and feel like they’re doing a similar thing: Ascend The Hill, Loud Harp, The Ember Days. We also love United Pursuit, Misty Edwards, Jaye Thomas, Jonathan David Helser and the Cageless Birds and so many others! One of the exciting things about being a part of this worship movement is that we’re just one small part of something God is doing all over the Earth. There’s so many creative, talented worshippers being raised up that most people will probably never even know about, and it’s awesome. I think it’s heading towards some of biblical prophecies of worship arising from every nation, like Malachi 1:11. You’ve said before that you’re big fans of tea and cake. Can you recommend some particular flavours of tea and cake that go well together? Nathan is our real tea enthusiast, he’s got all the gear and makes all these crazy flavours. For me, you can’t beat a simple Yorkshire tea and a slice of Banoffee Pie. Boom. What’s next for Rivers & Robots? We’re doing a few dates in Czech Republic this month and then a few festivals and dates over the summer in the UK. We’ve also just started a new thing, where we do creative worship nights in creative places, every month. So we’ll be doing more of those, and hopefully sometime soon we’ll get to come over to the US. We just want to spend time meeting people and getting to worship together with these songs before we go back and work on whatever’s next! So we’ll just wait and see what opportunities come along. 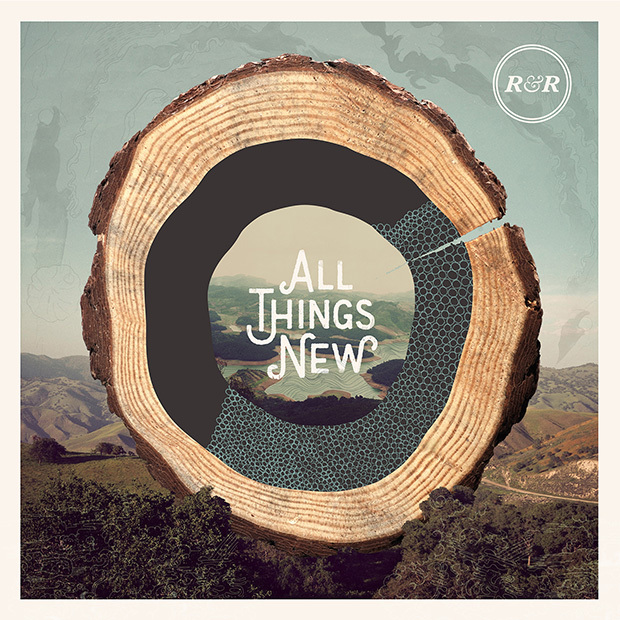 All Things New by Rivers & Robots is available now as a free download at comeandlive.com. You can still support the band by purchasing the album on Bandcamp and iTunes. Read our review of the album here. For more interviews, connect with Reel Gospel on Facebook and Twitter. Posted in MusicTagged All Things New, Interview, Jonathan Ogden, Rivers & RobotsBookmark the permalink.